Educational seminars, catered lunch, free bag of goodies, free plant, and more giveaways! Looking for a creative gift for a gardening friend? How about tickets to an entertaining yet educational gardening event? Get ready for a full day of gardening fun! 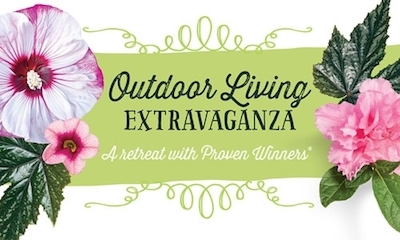 The annual Proven Winners Outdoor Living Extravaganzas are coming to three cities this year to get you pumped up for the new gardening season. Their educational seminars will inspire you with new plants, design ideas and more, and you’ll have a chance to purchase plants and other gardening goods right there at the show. Everyone will go home with a FREE bag of valuable goodies, one FREE plant, and a head full of ideas to put to use right away in their garden. For more information and to register online, click here to go to the Proven Winners website.